San Francisco, April 17: Microsoft has unveiled its Xbox One S All-Digital Edition for $249 which would be available starting May 7. This is a new model that will be sold alongside the original Xbox One S and the more powerful Xbox One X. The new console comes with three popular Microsoft-owned titles, namely Sea of Thieves, Forza Horizon 3 and Minecraft. Nepal Bans PUBG Aka PlayerUnknown's Battlegrounds Citing Violent Content Had Negative Impact on Children. Introducing the 1TB Xbox One S All-Digital Edition. ✅ Go all-digital with disc-free gaming. ✅ Games, saves, and backups are safe in the cloud. 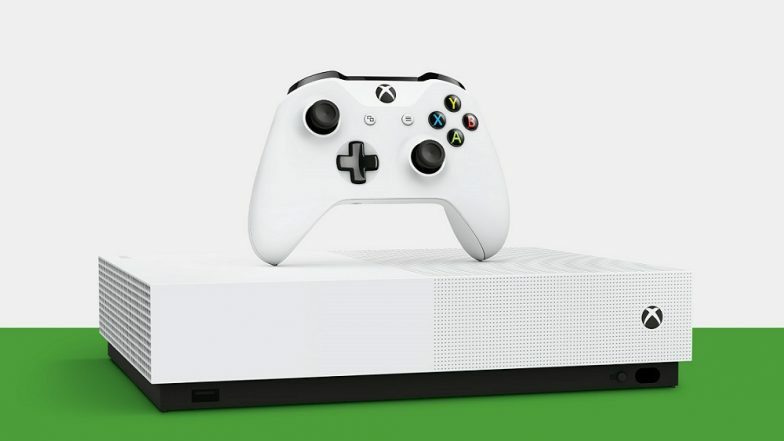 "The Xbox One S All-Digital Edition is $50 less than Xbox One S and we expect to maintain at least this price difference between the two consoles," Jeff Gattis, General Manager of Platform and Devices Marketing at Microsoft was quoted as saying by The Verge. There's also a special offer on Xbox Game Pass, the monthly subscription service that includes access to more than 100 games.